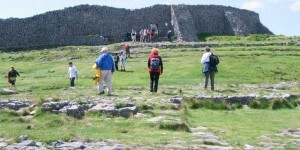 The walks on the Galway and Mayo Walking Tour are at a relaxed pace up to 8 miles (12 km) daily, ideal for those who like their walking without too much effort. You will be taken a different direction each day to ramble and explore quiet country lanes, bog roads and wild Atlantic coastal paths. The cycle day has 2 distance options along the route up to 40km. Westport nestles under the shadow of Croagh Patrick, overlooking Clew Bay and its enchanting islands. There are some wonderful craft & pottery shops, bookshops, restaurants, pubs and art galleries as well as the beautiful tree lined boulevard known as The Mall. The town weaves its spell around everyone it meets. Arrive Westport train station on the afternoon train due at 15.55 hours and transfer to your B&B just outside Westport by minbus. Dinner in Westport town at a restaurant of your own choosing. For anyone who wants some musical entertainment. Westport is a veritable Mecca for traditional music with a member of the famous Chieftains owning a bar in the main street. Walk time: 3 hours – Height gain 465m, distance 5 miles. Beginning just outside the village of Leenane our walk commences on the Western Way. This is followed by a 15 minute road walk before we join the famine road that runs through to Rosroe village. Westport’s special mountain, this conical shaped mountain that dominates the landscape standing at 764m high offers breathtaking views of Clew bay. The path to the summit has started to erode somewhat, and the climb to the top may not always be achieved as the weather and group fitness has to be factored in. The bus will take you to Westport town after breakfast. Westport is a very special town and is unique in that its one of the few planned towns in Ireland. It has won the tidy towns completion several times and has been voted as Ireland’s best place to live. With its lively pubs and great choice of restaurants you will pass your day off very nicely. You will be dropped in Achill and cycle the 25 miles back to Westport on the now disused Westport – Achill rail line. Today is a half days walk. We start on the north side of Clew Bay wand walk a section of the Burrishoole bog roads. We will be back in Westport town by lunch time where you will have the opportunity to catch up on any last minute shopping. We say farewell to each other .The bus will drop you at Westport railway station for the 09.45 departure. For the duration of your holiday you will be based in a family run B&B just outside Westport town centre. A taxi is necessary for your return home. This costs no more than €8. 7 dinners, drinks, entrance to Kylemore Abbey – the group rate in 2014 was €8. 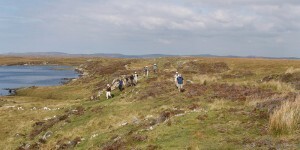 This is a one centre, guided walking holiday.